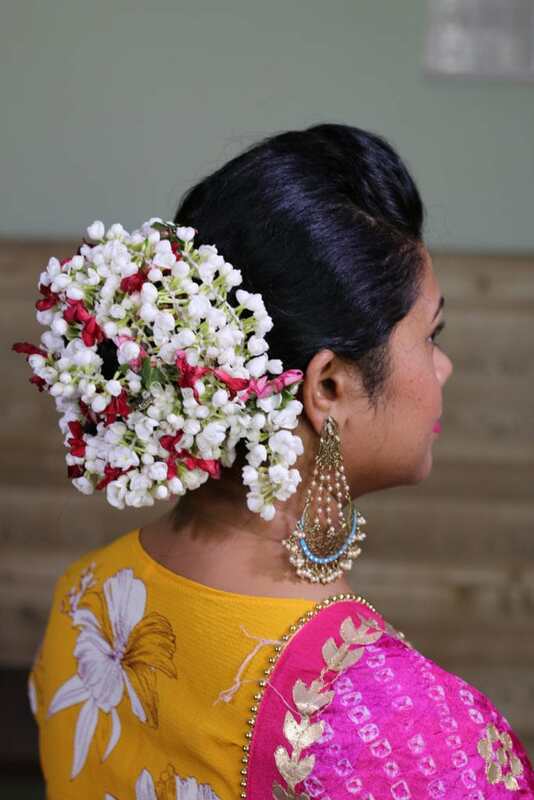 Wearing flowers in hair ups your glam quotient, making one stand out in the crowd, especially in weddings and other soirees. However, if you are tired of watching YouTube tutorials on DIY floral hairstyles and still can’t get it right, here are some super simple ways to do it. That too in flat 2 minutes! 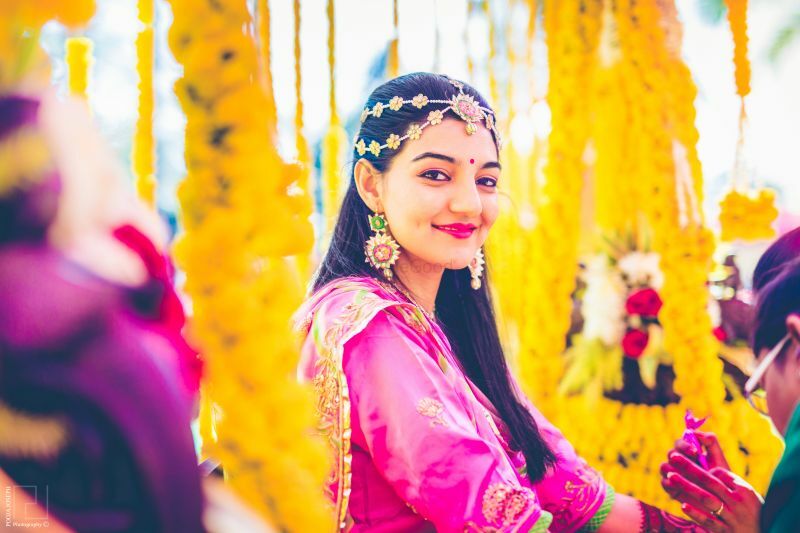 Also, don’t forget to head over to WedMeGood.com, India’s Best Wedding Planning Site for some serious Makeup, Hair and Fashion inspiration. 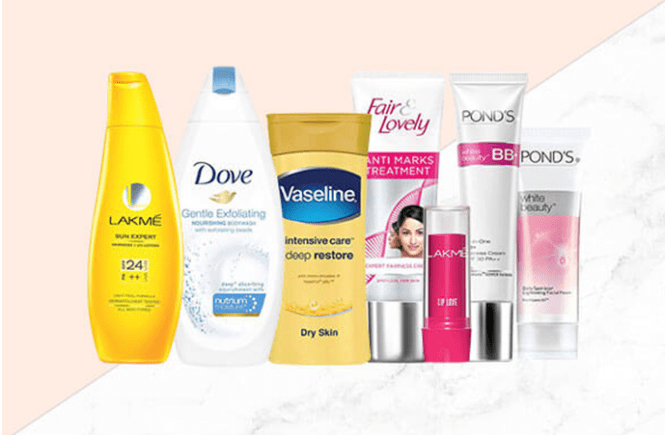 You can also book professional makeup artists, hairstylists, photographers etc who would make you look flawless on a special day. I draw so much inspiration from their absolutely gorgeous Instagram feed @wedmegood for my own pictures. So, let’s begin with the post. 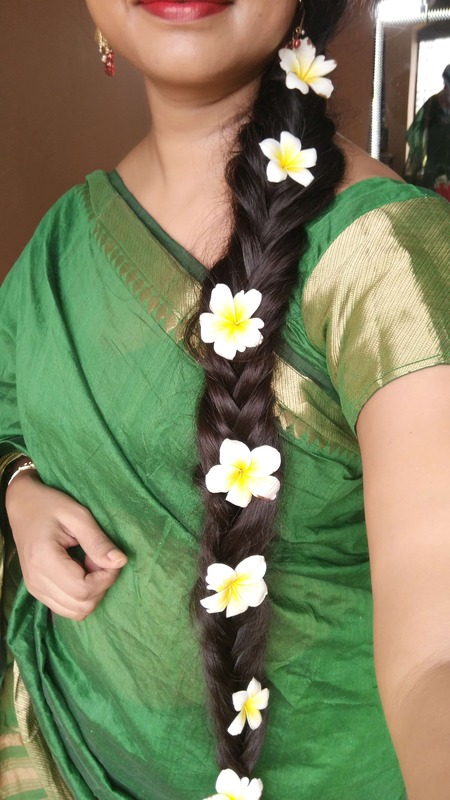 I know, there is nothing special in this ‘hairstyle’, though, it is still the easiest and most feminine way of wearing fresh flowers. 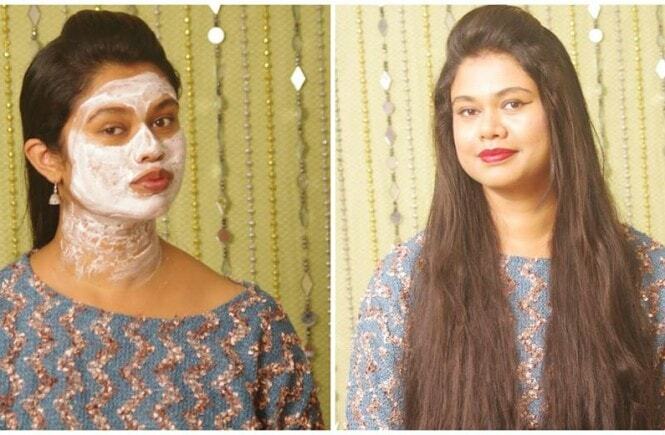 Just take 3-4 strands of jasmine gajra and tuck them in your half-up half-down hair. 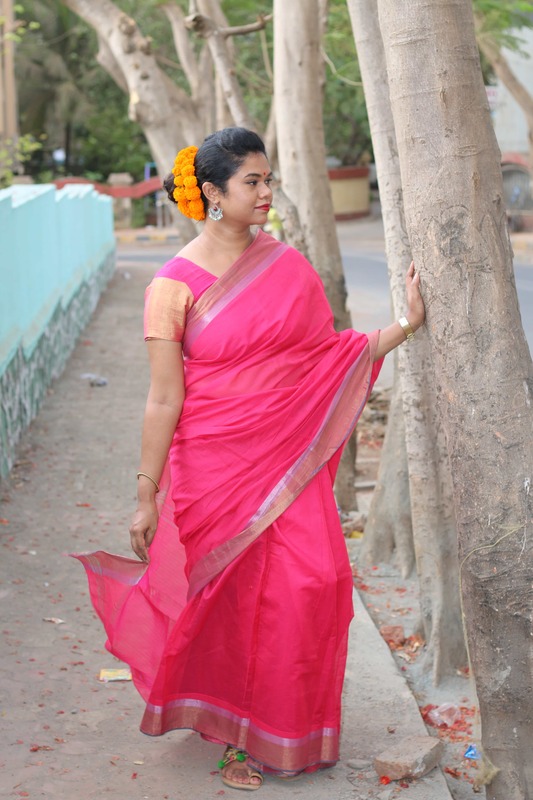 This look works great for daytime events. 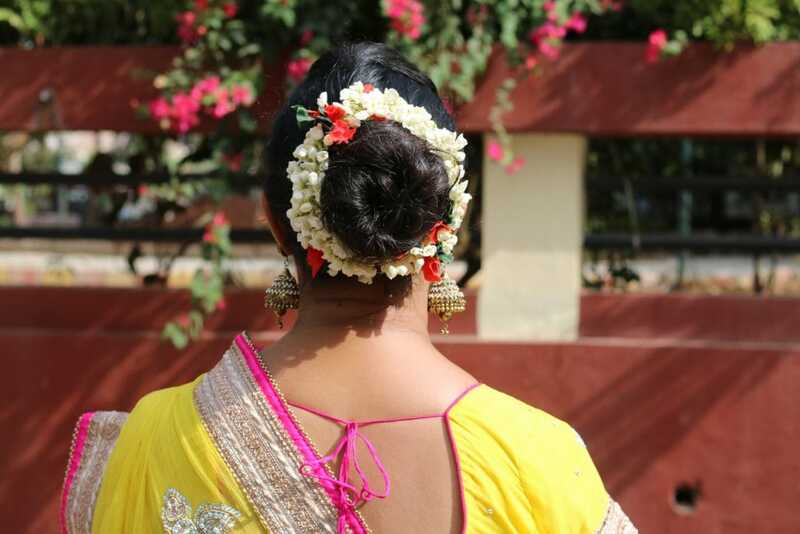 We love wearing our hair up, especially in this heat, don’t we? So, why not give it a glamorous touch by wrapping around fresh jasmine buds. It honestly takes 2 minutes to fix the gajra into your regular bun. Wear some statement earrings to complete the look. 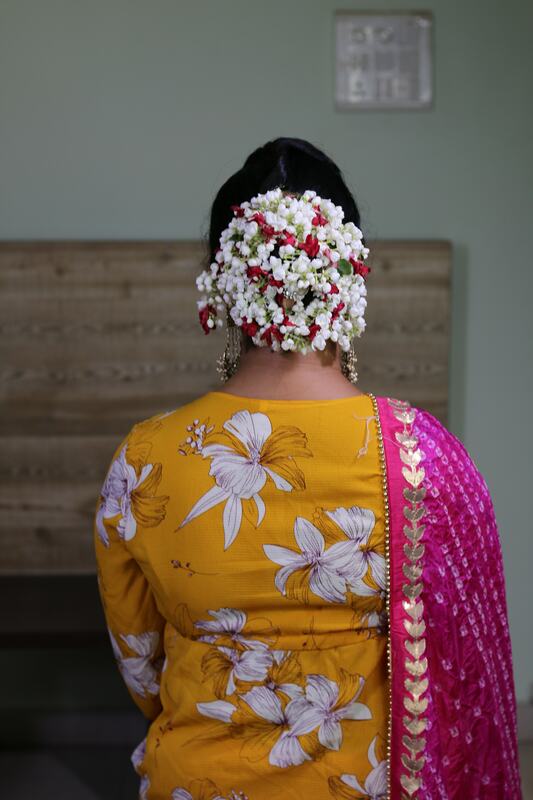 You can also go full glam by covering the entire bun with flowers. Braids are hot this season with multiple versions of them ruling our Instagram feeds. 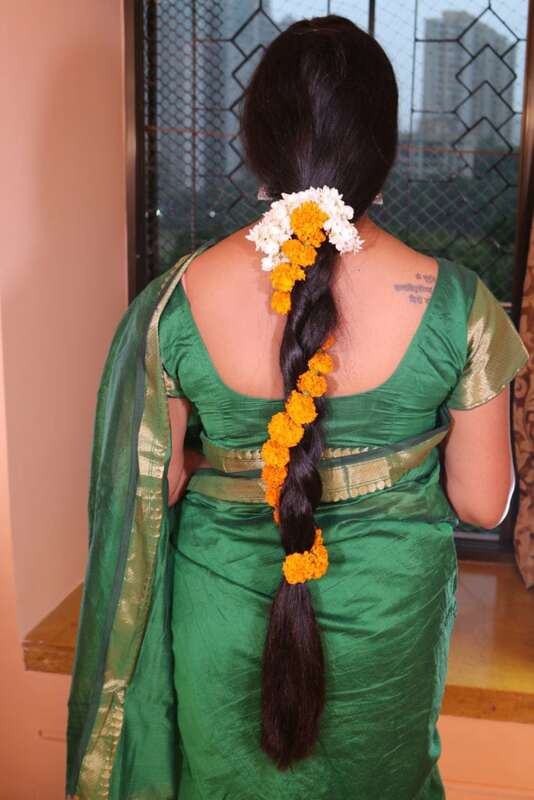 Try sticking a few flowers randomly even in your simplest braid. 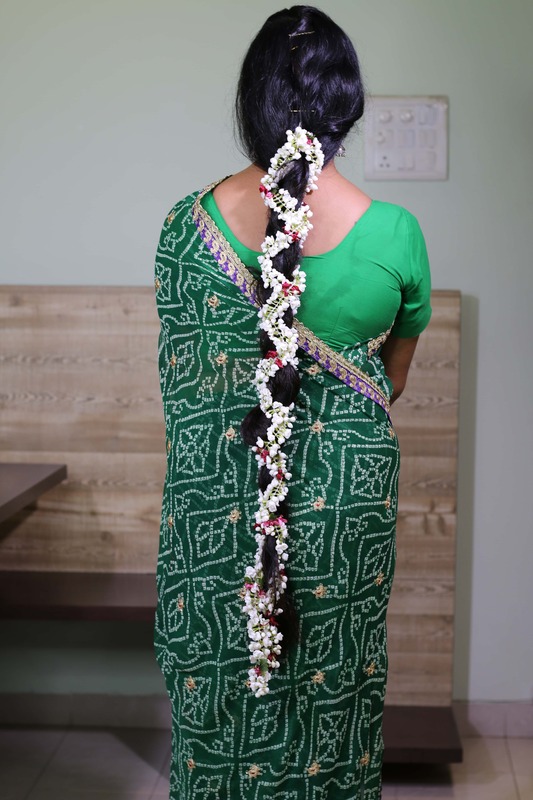 I have grown up watching my aunts and mom swirl flower garlands around their braids on special occasions. 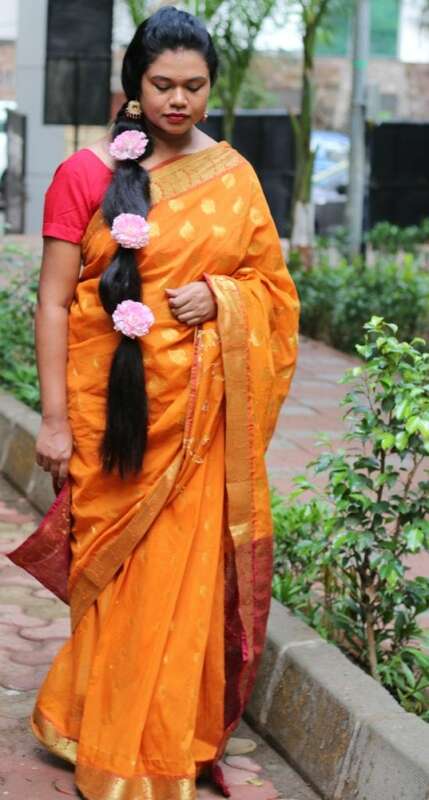 You just have to tuck one end of the gajra at the base of your braid and wrap it in spiral fashion till the end. It is that simple! Choose any kind of flowers you like to match your outfit or makeup. 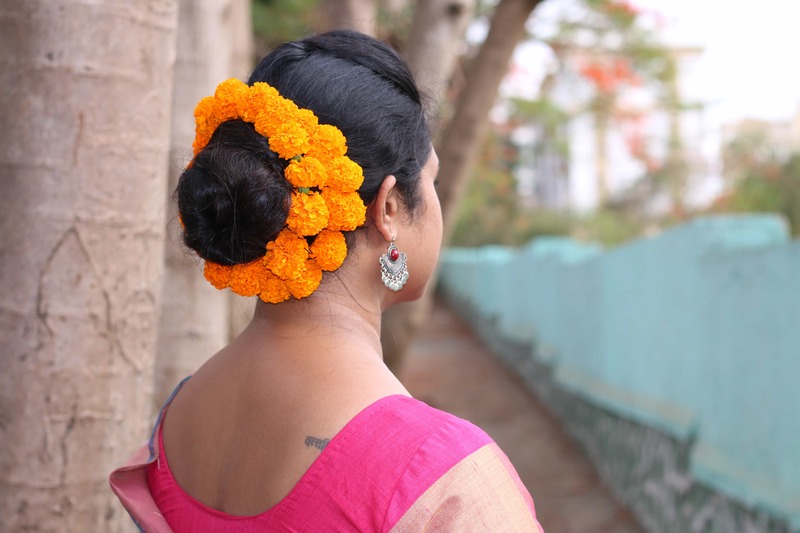 Marigold is a staple at all auspicious occasions. 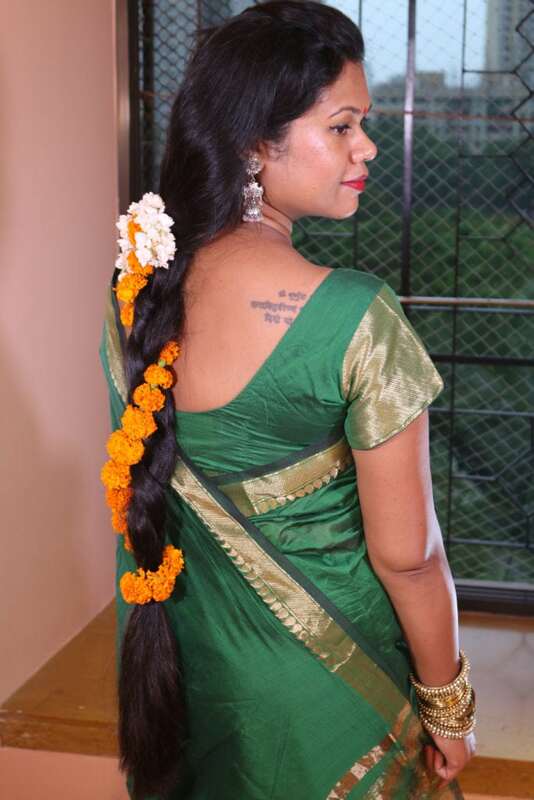 So, why not have it in your hair as well? I love to wear it in my bun for a brilliant pop of color. 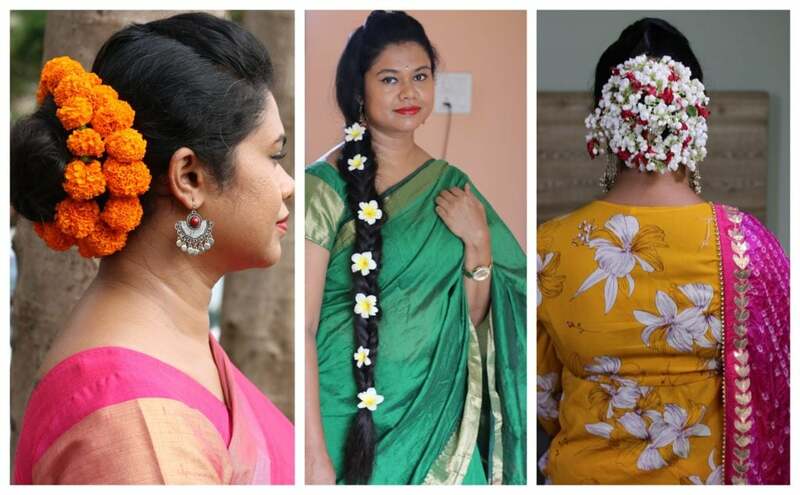 So, I hope you would be trying these easy floral hairstyles in the upcoming wedding/festive season. Do let me know in the comment section whichone was your favourate. 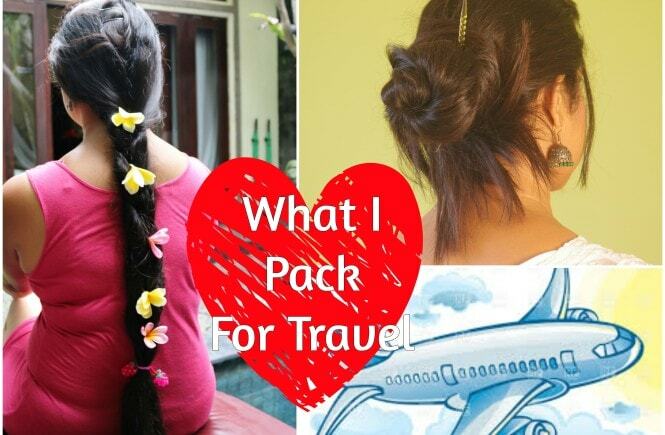 Watch my YouTube channel sushmita’s Diaries for hair care videos.